B.L. 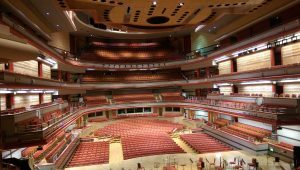 Acoustics have successfully completed the replacement of Voice Alarm and Control Systems at the International Convention Centre in Birmingham. The 25 year old Audix systems were replaced with Bosch Praesideo EN54 compliant systems communicating via a site-wide optical network installed by BLA. The control systems were replaced with a combination of Bosch hardware and custom B.L.Acoustics software. The ICC boasts 10 meeting rooms and 10 conference halls, including its flagship Hall 1 auditorium and the larger Hall 3. The venue hosts around 400 events and welcomes around 300,000 delegates every year. 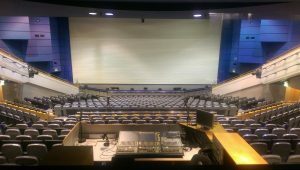 The voice alarm system at the ICC comprised of Tannoy Audix equipment already updated in 2005 with the replacement B.L.Acoustics/Barns V32 Control Matrix. B.L. 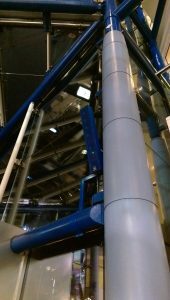 Acoustics have been maintaining the systems at the ICC for many years which helped us to acquire substantial site specific information which proved to be valuable throughout the complex installation. One of the major priorities for our client was to have absolute confidence in the supplier and that the systems could remain in full use during their replacement. The venue is an extremely busy one, meaning that downtime of the system would have been unacceptable. The system consists of equipment installed at 7 different locations throughout the site. The project involved multiple phases of installation, starting with installation of a new resilient loop in fire-rated fibre cable between each of the 7 locations. A number of temporary satellite systems were built to provide a fully networked front-end which was initially configured to take over primary control of the existing Audix systems. The temporary but fully functional and networked front end provided the interfacing needed between the many existing control panels and the Audix system. 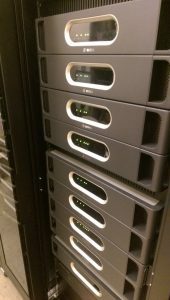 Once the system front-end had been successfully proven, each temporary rack could be upgraded to their permanent racks of equipment. This method of operating both existing and new systems concurrently meant that each equipment location could be upgraded and tested on a system-by-system basis without compromising the operation of the venue. The system has a multitude of inputs which had to be carried forward from the previous system. The different halls required different microphone and input options. These included input panels for the House Managers, Theater Stage Controls and Stage Managers Desks. B.L.Acoustics provided re-engineered panels which were custom built to fit their various locations. The panels cater for input and control of microphone announcements, show relay, auxiliary audio and audience recalls. The system also allows for pre-routed audio channels for direct patching of AV audio to zones within each hall. B.L.Acoustics provided custom software for both engineering and operational functions of the system. It was important that the user interfaces were intuitive and built specifically to the requirements of the site. The interfaces were designed very much with the clients involvement to provide the most familiar and intuitive operation for such a large & complex site. The security control panel used touchscreen operation with a detailed rotating 3D graphical display of the ICC complex, on which zone selection and system activity could easily be shown. Engineering software was also provided for technical staff to use. This allowed the staff to configure various PA routing prior to events and allowed control of audio processing for each configurable input. The system configuration and fault monitoring software was also written specifically to be informative and user friendly. All Loudspeakers were replaced to meet the latest EN54 standards; this involved designing the ceiling speakers to fit into the tight space allowed for the existing fire domes whilst also meeting the strict specifications. Custom construction and close colour matching of speakers, mounting plates and brackets for each type of chosen speaker was needed. Compact Bosch ceiling loudspeakers were utilised in most areas together with specially manufactured mounting trims. JBL fixed angle column loudspeakers were used within the mall to minimised spill and high power JBL 2-way cabinets were used at high level within Hall3. 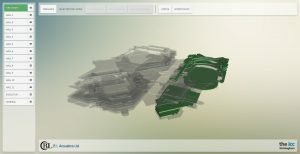 The central mall along with the larger halls were modelled in detail for their acoustic performance using CATT Acoustic software. The mall was of particular interest due to its length in excess of 100m and its highly reverberant construction. The model proved the performance of our choice of JBL column loudspeaker, was such that no additional acoustic treatment was required. We consistently met or exceeded our STIpa target with a measurement of 0.60 STIpa in most areas.